In what will go down as one of the most dramatic college football contests of all-time, USC (10-3) pulled out a 52-49 victory over Penn State (11-3) in the Rose Bowl, as Matt Boermeester connected on a game-winning 46-yard field goal with no time left. 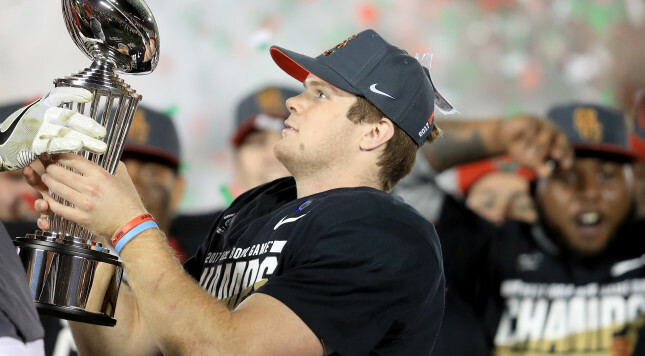 Overall, quarterback Sam Darnold set a Rose Bowl record with five touchdown passes, along with a 453 yards through the air, to help the Trojans claim a FBS record-setting win No. 25 at the venue. The two programs even combined for the most points in the bowl game’s history. With under 12 minutes left in the fourth quarter, the Nittany Lions boasted a 14-point lead and appeared to possess all of the momentum. Nevertheless, the Trojans obtained a bit of magic to spurt their eventual comeback. On third down at their own 21-yard line, Darnold gunned pass over the middle that was tipped, but it would then land in wide receiver JuJu Smith-Schuster’s waiting palms. Later on the drive, the junior somehow hauled a 27-yard snag, where Darnold had a millimeter of space to zip the ball into. Those two catches led to a two-yard touchdown run via tailback Ronald Jones II to cut the deficit to a one-score game. In total, Smith-Schuster compiled seven catches for 133 yards and a touchdown. After both teams failed to move the ball much over the subsequent three possessions, Darnold had one last opportunity to to tie the game with just under two minutes to go and no timeouts. The redshirt freshmen sliced through the evident doubt, leading USC on a three-play, 50-yard drive in 38 seconds, which was also aided by two pass interference calls. He capped off the exhilarating sequence with a 27-yard touchdown strike to wideout Deontay Burnett to knot the contest at 49 apiece. Penn State QB Trace McSorley followed that up with his third interception of the evening, as cornerback Leon McQuay III jumped the route on the right sideline. In the regular season, McSorley only threw five interceptions, but his last mistake evidently hurt the most, culminating in Boermeester’s aforementioned heroics. What happened on the late interception? Given the fact that Darnold must play at least another two seasons before entering the NFL draft, he’ll easily jump into next season’s Heisman Trophy race. On top of that, the 6-foot-4, 224-pound signal caller should put USC in the national title conversation, too.